Wall mount surge protector features individual six outlets that pivot for adapter fit. 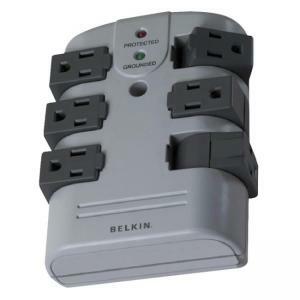 Three-line AC surge protection is ideal for basic household electronics and appliances. Six rotating surge-protected outlets allow room for large block space outlets. 1080 Joule energy rating provides maximum protection of all your sensitive electronic devices. Surge protector filters EMI/RFI noise up to 75 dB reduction.